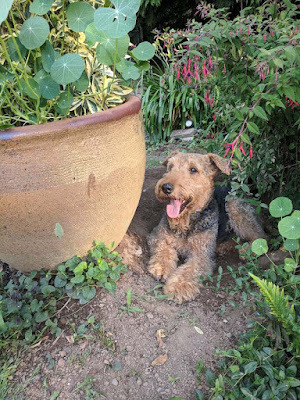 Gardening with Wyatt: What's hot?.....American Journey Treats! OMD..it's so hot! Nothing to do but lay in a dirt hole. ….Or stand in the pool all afternoon. ...and watch the wasp traps fill up! No way mom is going to make any home-made dog treats in this heat! So, we are VERY happy that we have Chewy.com, to send us American Journey Treats. Delightfully healthy, baked treats, with peanut butter. YUM! Just bring those snacks out here to my dirt hole and everything is gonna be all right! p.s. We received this product free of charge, for our honest opinion. Oh guys, you gots the right idea! Or, at least you do Wyatt! I'll take a cool dirt hole over a water bath any day of the week! Nows, those treaties look mighty tasty!!! I'll take two please! I trust your staff obeyed. I have had those treat before and they are De-Licious! OMD a dirt hold sounds funny! It must be good cause Mitzie does that too. Keep cool, today is going to be OT again. You two found a couple of good ways to beat the heat. Having a delicious snack can only make it better. 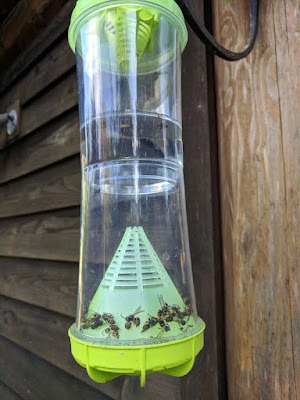 Momma is all intrigued at the wasp trap. We've seen a few in our yard lately, but there aren't any nests she can spot. We might try that. I bet those were extra yummy! Stay cool guys! Peanut butter makes everything better, even the heat!!! Enjoy those treats and try to stay cool. We are going to see if Mom has some of those American Journey treats around here too. 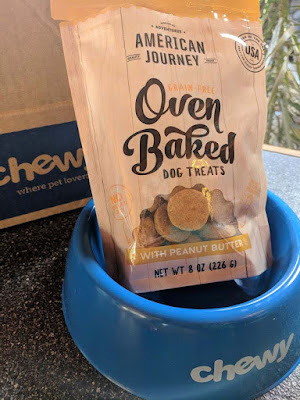 It doesn't get much better than nommy Chewy.com treats while sitting in your dirt hole! That's one deep hole Wyatt! I bet you and Chance could have a contest for the deepest dirt hole! bol! 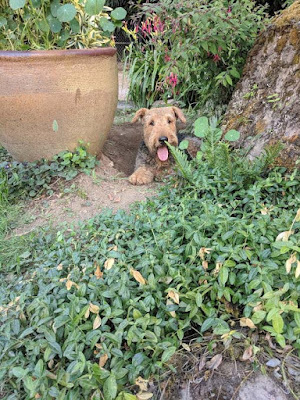 We all love a good dirt hole around here to hang out in. The pool is fine, but we like dirt best. Any way you can stay cool...the dirt OR the pool! The heat is stifling! Those treats sure do look good! Perhaps on top of a bowl of ice cream! BOL! It sure is hot here too. The hottest, driest Summer since at least 1976. Best wishes to Wyatt from Daisy. Send me a pee mail! Flowers on Friday...not for you Bambi!! Flower Friday 🐇🐇🐇The rabbit edition! It's a tent..it's a parachute...it's a hammock!! Red, White & BLUE BARS!! Hi! 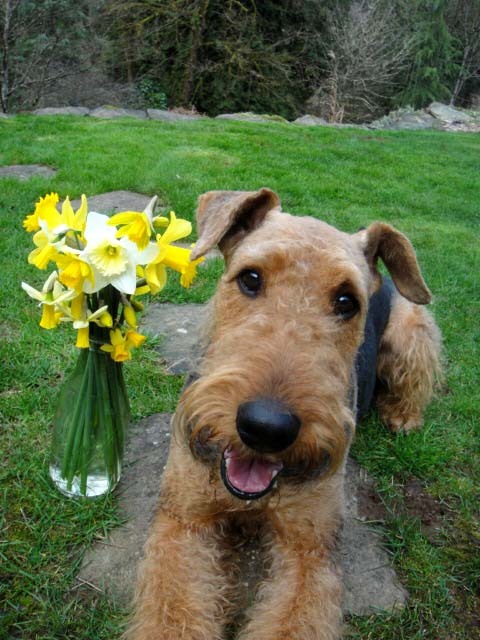 I'm a 10 year old, Airedale Terrier. 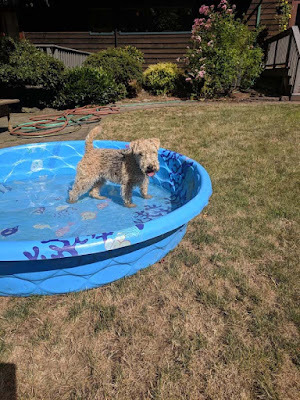 I live in Oregon, with my Mom and Dad and little Lakeland Terrier sister 'Tegan'. Follow along, for Terrier fun in the garden!